A couple of weeks ago, I chatted with British picture book author and zoologist Nicola Davies about her newest picture book, The Promise (Candlewick, March 2014), illustrated by Laura Carlin. I already linked to that here at 7-Imp, yet I completely forgot to share the spread from the book that I have on hand. THE PROMISE. Text copyright © 2013 by Nicola Davies. Illustrations copyright © 2013 by Laura Carlin. Reproduced by permission of the publisher, Candlewick Press, Somerville, MA on behalf of Walker Books, London. 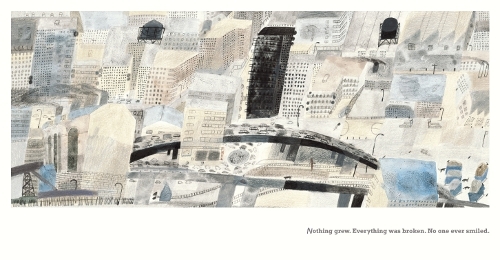 The “Nothing grew.” cityscape illustration is absolutely beautiful.